There’s a ridiculously simple way to build your startup. Once you know what it is and how it works, then you’ll want to kick yourself for not trying it sooner. In fact, this solution (outsourcing) has flooded many successful startups that all of you know now as a giants. But today I’m not going to show you how your startup can use outsourcing to boost and scale your business. I’ll reveal pros and cons of software development outsourcing so you’ll see how powerful it can be for your startup. Bonus: Read it till the end or scroll all the way till the end to find out how to avoid cons of outsourcing and one single tip on how to successfully outsource your project. Before I start, let me ask you a question. What comes into your mind when you hear the word “outsourcing”? Indeed, for many years the word “Outsourcing” has been treated as a dirty word in tech world. Outsourcing your software development for startup makes sense when your aim is for fast product development and launch it to the market. You know it. When you have a startup, especially on early stage the key is speed. Speed is unavoidably important the same goes with quality. Here are pros and cons that can change your perception about outsourcing. ・Founder who does EVERYTHING, no question require. ・Co-founder who is likely to be techie person. ・Non-tech allrounder. He works along the founder to do EVERYTHING. I maybe exaggerating. But many startups in an early stage look like this and founder feels the need of hiring another developer to help CTO, right? This means you need to start looking for the RIGHT developer for your product and that is not your work. It will take a lot of time. Just leave it to outsourcing team and you’ll have plenty of time to focus on much essential task for your business. Instead of hiring in-house developer, startups can have an option to outsource certain parts of a project until it is completed. Having a talented software developer in your team is great. Especially when he knows everything in programming which is in reality is hard to find. Offshore outsourcing can provide companies to fill in gaps and provide skill-set they need, for much less cost rather than hiring an in-house programmer. Seeking the right skill-set for your program developer is tough. You might find yourself having few options to do the work for you because only few of them is expert on it. Most of offshore software development outsourcing companies utilize Agile and Kanban strategies. They focus on small and expert teams that work together as a whole. Having a small team that solely focus on your project or developing your software makes the work faster and this translate that you can launch it immediately to production. They are extremely efficient because team members challenge one another and keep up the pace. Last but not least, outsourcing is cost efficient. Period!! Startup that is in early stage also has tight in wallet. You want to allocate your seed round funds carefully and wisely to avoid running out of cash. The average cost of hiring a software developer is more inexpensive when you get someone from India or China and etc., compared to the countries like UK and USA. Today Eastern European countries like Ukraine and Romania are also reputed for producing quality programmers for less COST! They run out of CASH. And this is one of the prime pros and reasons why companies and startups seek for offshore outsourcing. Yes. There is always a risk involved. Unfortunately and mainly, because you expose confidential company information to a third party. You have to build a trust with outsourcing company. Today, more and more offshore companies offer a free consultation to discuss your needs and most importantly gain your trust. Nowadays, lack of communication is one of the number one challenge for outsourcing your software development team. But this is a common problem for everyday who runs a company, right!? Communication is always a key factor to success. I can only say that when you outsource some of your project being clear upfront of what your goal is a MUST. Also you need to communicate with them often and this can be done by setting up a daily or weekly meeting with them. Both parties needs to know the expectation on each side before hand. Other than this factor, there are many outsourcing companies all around the world which means they have different language , culture and mindset. First thing you need to keep in mind is that when you outsource, there is a need to establish on how they can provide you updates like improvement, challenges and timeline for your project. Therefore, you need to ensure that they have a manager that will constantly provide you the updates and knows how communicate well with you. He also needs to manage each day to make sure his team understands the requirement of the project or deliver their task correctly. But good outsourcing offshore company understands the difficulty. The good one will manage their own daily to report you back so you don’t have to check in everyday. After all, what really counts is the quality of final product. This is one important thing you need to have in mind when choosing the company to go to for outsourcing your project, do they have a good reputation or track record for this specific work you want them to do. Take a look at their portfolio and previous clients. Do you think they are the expert that can do the job for you and perfectly execute your project or product? The only way you can assure is to review multiple times their portfolio or previous work and have they done a similar project as yours. Some outsourcing companies hold several on-going projects at the same time. Therefore, there would be a chance they loose their focus on YOUR startup tasks. Now you understand the pros and cons of software development outsourcing for startup. How can I avoid pitfalls? How can I have successful outsourcing experience? Is there any secret that you don’t know? It may happen behind the scenes, but some startups knows how to get best outsourcing experience to the next level. That is how 25 large startups you know such as Slack, Fab, Skype, Github, and Basecamp that have succeeded using this strategy to launch their highly-valued startups. They understood how much less they can deliver a product than having an in-house team. They already skills in place, this means you don’t need to spend time in training them. What does this mean for startup? Well, it’s easy and simple. Low costs and knowledgeable talent equals to get infrastructure developed faster and your early stage startup can lanch sooner. So what exactly these 25 successful startups did? All of them followed this one simple tip. Before you make a contract for long term in a first place, test a couple developers and make sure they can code. 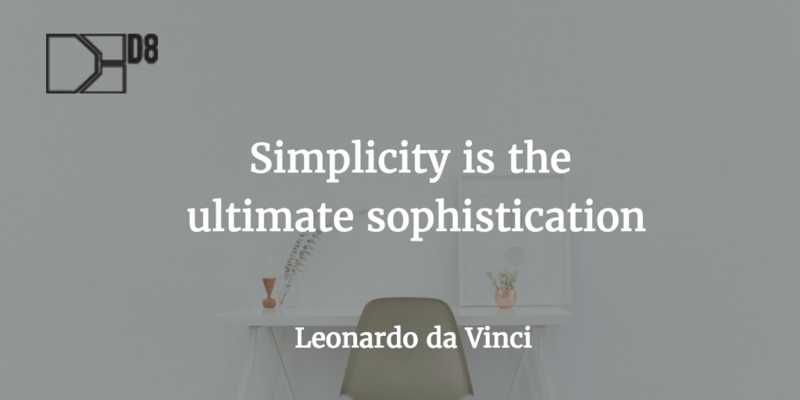 Like Leonardo da Vinci said, “Simplicity is the ultimate sophistication”. SO make sure you have someone who understands code. So Outsourcing is your solution or not? Do your best approach properly and avoid cons. Cons can turn into Pros if done correctly, It all depends on the firm you choose to outsource your software development. If you are still unsure about outsourcing your software development team, it is perfectly normal. Because there are so many excellent software development outsourcing companies out there to choose from. In fact, I would like to have a further discussion with you. Feel free to drop me an email taiki[at]d8ii[dot]com. And I respond to every single one of your email.